Today I am sharing beautiful and unique gifts that you don’t have to buy, with materials readily available in your house – old books, paper, and cardboard. All you need is imagination and a little bit of time. Yet again I am joining my friends from Kid Blogger Network in a big giveaway and in sharing ideas that could be interesting for parents and caregivers looking for fun activities to do with their kids. This time around the theme is Christmas! 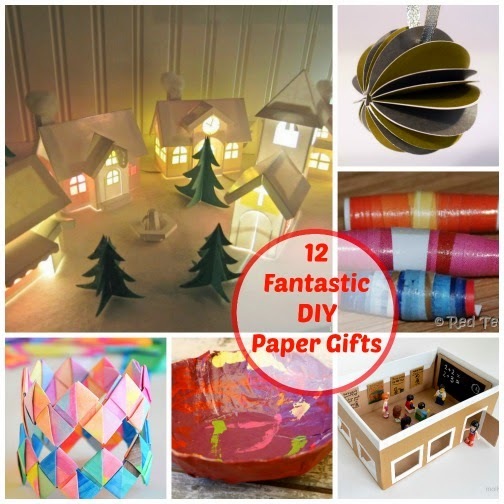 As all of us are considering what gifts to buy and to make for our friends and family, I thought to share some amazing gifts that can be done with paper and cardboard. My husband made this paper winter village over several years painstakingly designing and cutting each house by hand. Since now we have a paper cutting machine (Silhouette Portrait), we are planning to give Christmas houses to our closest friends as a special Christmas gift – from Planet Smarty Pants. Repurpose a shoebox to make this mini-classroom for Lego or Playmobil characters – guaranteed to entertain your children for longer than a store-bought version – from MollyMoo. Surprise your kids with a play structure made out of recycled newspapers… or build it with them! – from Inner Child Fun. Why buy a dollhouse when you can build your own exactly to order. Older kids can even build cardboard dollhouse on their own for their younger siblings – from Filth Wizardry. My husband made this cardboard table top puppet theater several years ago, and it is still in active use. Great for playing out the Nativity story – from Planet Smarty Pants. Make your own paper beads to use in bracelets or necklaces. Great tutorial for easy DIY paper beads from Red Ted Art. Make your mirror frame or photo frame special with this decoupage project from Moms and Crafters. Use your kids process art and make beautiful and unique paper bracelets from Picklebums. This paper ball ornament is pretty enough to give as a present or use in your own house – from Serious Whims. Are you giving homemade gifts this Christmas? So many great ideas that I want to try in this post! Some fun paper crafts! Thank you for sharing at Sharing Saturday! !